Time for the Cerbera 12k service. My plans to have the car serviced locally had been scuppered, as it was up in Birmingham having the Speed Six twin headlight conversion, so it made sense to have the 12k service & mot carried out there at the same time. 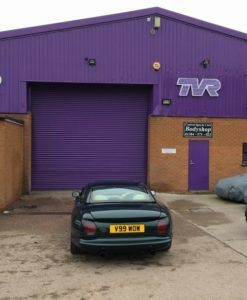 Adrian & Andy are probably the nicest people I have met in the TVR scene yet. Nothing is too much trouble for them. They gave me the confidence that they knew their stuff, and that my P&J was in good hands. Central TVR is an impressive building. There were so many cars there is various states of build. I could have stayed there all day chatting to Andy. It passed the MOT with no advisories, with Adrian commenting it’s one of the tidiest Cerberas he has seen in a while. It was a fair chunk of change – don’t get me wrong; but now finally, I can cross of the last of the items flagged up in the Pre-purchase inspection, the car is perfect and is testament to the drive it delivers. And wow does it sound epic. The soundtrack deserves a post of it’s own, more to come on that later. I had the car trailered back to me from Birmingham. The sun was shining when it arrived.. so time to put some miles on it.